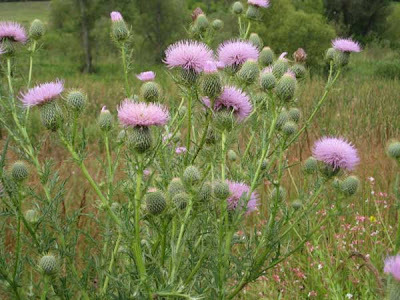 This is the time when the pasture thistle (Cirsium discolor) is in full bloom. The goldfinches love them. (One year we even had a nest in one!) 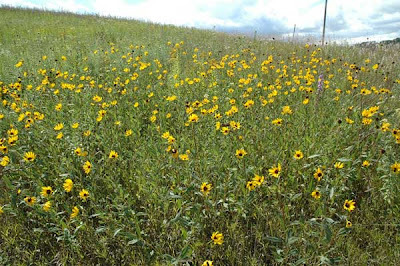 Right now we have lots in bloom in our planted prairies, with some also in bloom in the more open savannas. I love the delicate color of this thistle's flowers. The photos here were taken in a dryer part of the Crane Prairie, where there are lots in bloom. Once a plant gets started flowering, it keeps it up for quite a while, as new buds keep developing and opening. I have been told that goldfinches do not start mating until the thistles are in bloom. Thus, in contrast to most other bird species, they don't start raising their young until summer is almost over. 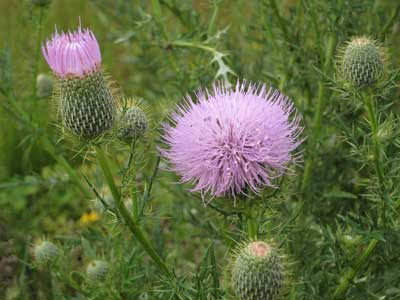 This thistle is a biennial, which means that once it flowers the plant dies. Thus, seed set is important in the maintenance of this species. However, seed production is prolific, so there is no problem with its survival. It is just that you never know exactly where next year's plants will appear. 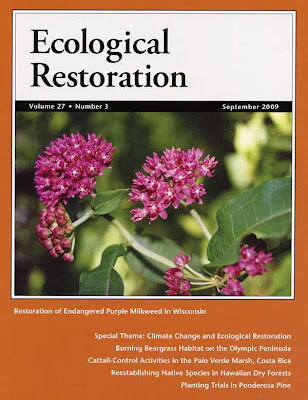 The September 2009 issue of Ecological Restoration is just out and has my article on ecology and conservation of purple milkweed (Asclepias purpurascens). And the cover has Kathie's great photo of the flowers! 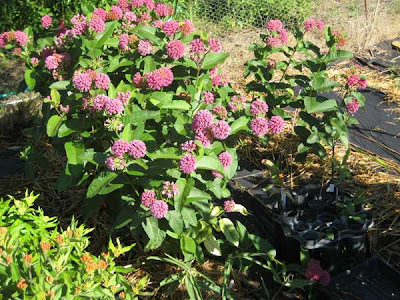 Purple milkweed is a State Endangered species which is fairly uncommon throughout the U.S., and there is considerable interest in getting it re-established. My article describes the work I have done over the past decade to understand the ecology of this endangered species. 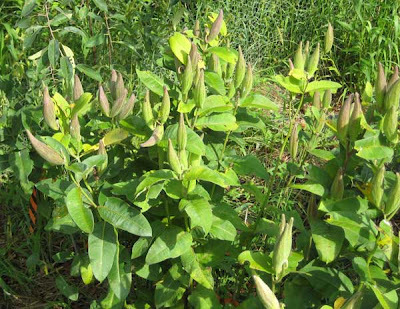 My work began soon after I found a purple milkweed plant in the first oak savanna area we had restored in 1999. As restoration progressed further plants appeared. Beginning in 2000 I established a permanent marker at each plant, and by 2008 I had twelve separate sites where purples had arisen spontaneously. I also collected seeds from the few plants that formed pods, and started raising plants in the greenhouse. These plants were then transplanted to likely sites in the field, and my success rate here has been fairly high. In addition to the 12 spontaneous sites, at present I have about a dozen transplants that seem to have become permanently established. 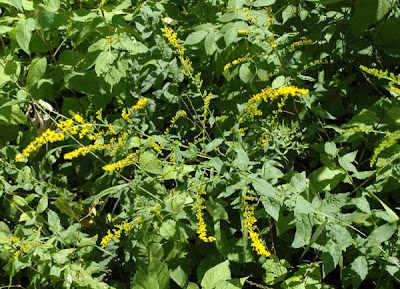 In addition, Kathie and I set up a forbs garden near the cabin where we could grow plants under more controlled conditions. For several years these plants really flourished, and in 2007 we had great seed set, as the second photo below shows. My paper describes in considerable detail the techniques we developed for raising this attractive plant. 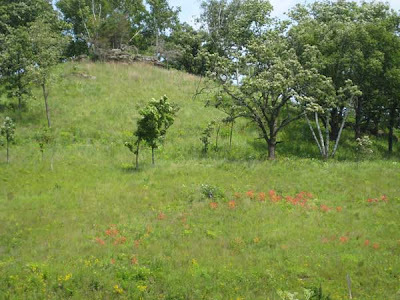 Ecological Restoration is a scientific journal which is managed by the University of Wisconsin-Madison Arboretum. The journal is affiliated with the Society for Ecological Restoration, an international organization that plays an important role in fostering ecological restoration research. In an early July post I described the way we are dealing with reed canary grass in upland sites. These are sites that had not been found in early June when the contractor sprayed with sethoxydim. The procedure is to tie up all the stems of a patch, cut off the leaves, and dribble concentrated glyphosate (20%) down the stems. Recently I returned to a major infestation that we had treated in early July. The "before and after" photos show that the reed canary plants are quite dead, and there has been no resprouting. 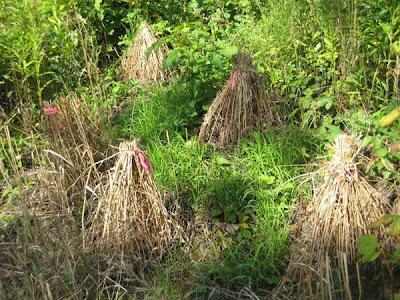 Since reed canary grass has a lot of dormant buds that could sprout, the results show that they have been eliminated by the treatment. Good to know. The genus Helianthus is a taxonomic problem since many of the species are similar or hybridize. We have lots of sunflowers at Pleasant Valley Conservancy and I have been trying for the past few years to sort them out. Right now they are all flowering, which helps. The sunflowers are all clone formers, which means they form patches, sometimes large. A few sunflower species are distinct enough that they can be classified with surety. Three that we have that fit in that category are sawtooth sunflower (H. grosseserratus), stiff sunflower (H. pauciflorus), and Jersualem artichoke (H. tuberosus, which is neither from Jerusalem nor an artichoke!). Sawtooth sunflower is found primarily in wet places, and we have it growing both in our marsh and (as a single patch, see photo at left) in the wetter part of the Valley Prairie. Stiff sunflower is primarily a prairie species which is just becoming established at Pleasant Valley Conservancy. 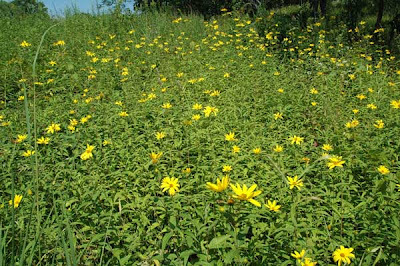 At present, there are two reasonably sized patches in the Pocket Prairie and a small patch below the prairie remnant along Pleasant Valley Road. This species is quite plentiful at the nearby Black Earth Rettenmund Prairie, and the photo here was taken at that site. 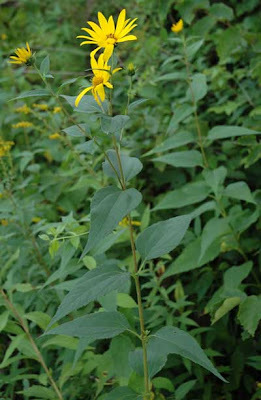 Jerusalem artichoke (Helianthus tuberosus) is a large-sized sunflower that forms extensive edible tubers. It is commonly found as large patches in marsh or wetland habitats, although it is also found in woodland areas. We do not consider this as a desirable species at Pleasant Valley Conservancy, and a large clone at the edge of our wetland was sprayed with glyphosate early in the spring. 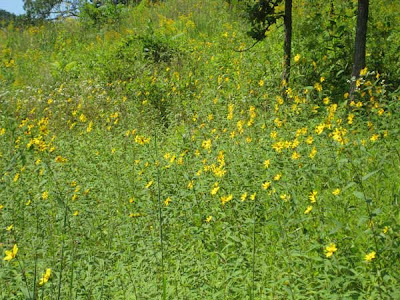 The bare area was eventually colonized with glade mallow (Napaea dioica), a State Threatened species. 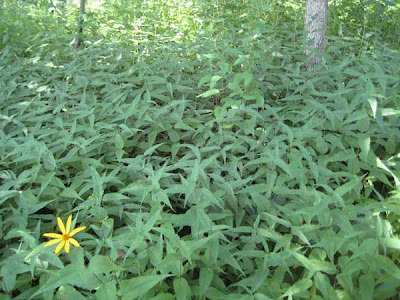 A small clone of Jerusalem artichoke still present along Pleasant Valley Road (see photo at left) will be monitored to ensure that it does not spread unduly. In addition to the small clones of the above sunflowers, we also have a very large number of clones of woodland sunflower. 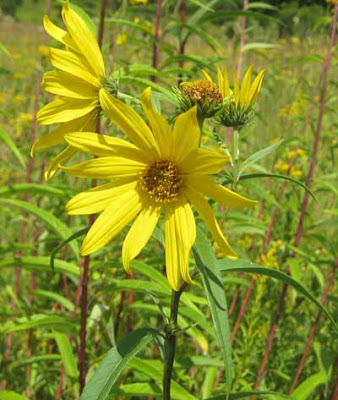 There are several species of sunflowers for which the name "woodland" has been applied, including Helianthus divaricatus, decapetalus, and strumosus. Although H. divaricatus is widespread at Pleasant Valley Conservancy, there have only been a few collections made in Wisconsin, including the one that we made from Pleasant Valley Conservancy. I assume that this species is actually more widespread in Wisconsin than the data suggest but for some reason has not been extensively collected. The main characteristics of H. divaricatus that separate it from the other sunflowers are: stems without hairs except near the inflorescence, lanceolate leaves, leaves opposite even near the flowers, and petiole small or absent. A survey in August 2009, when the sunflowers were at peak flowering, located at least 95 clones of H. divaricatus, varying in size from six feet to 50 feet in diameter (perhaps larger). The photo below shows a typical clone. Despite this fidelity number, tall boneset is quite common at Pleasant Valley Conservancy. We have it in prairie remnants, restored savannas, and planted prairies. (All of our plantings of this species came from seeds collected on site.) In Wisconsin its habitat is dry limestone (dolomitic) bluffs, just like Pleasant Valley Conservancy. All of the white plants in the photo above are E. altissimum. 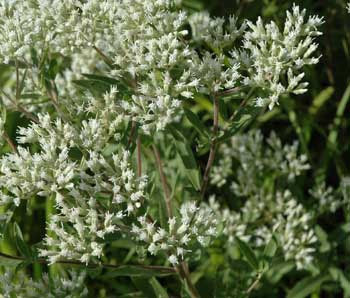 This species should not be confused with upland boneset (Eupatorium sessilifolium), another savanna species that is even less common. (It is not even included in the Cochrane/Iltis Atlas.) E. altissimum has a Coefficient of Conservatism of 4 and E. sessilifolium has a C value of 9. The best data on the original vegetation of Wisconsin come from the Public Land Survey records done in the 1830s before the state had been settled. These data have been used in the past in a qualitative way by John Curtis, and later by Robert Finley to create a map of the whole state. Although the Finley map was a huge effort and has been a very useful tool for plant ecologists, it has now been superceded by a version of the map created by Forestry Professor David Mladenoff's group using GIS technology. This new version is available as an insert in Wisconsin Natural Resources Magazine and as a PDF version at the following link: This version has the advantage that it can be enlarged on the computer screen so that any small area of the state can be analyzed in detail. Since all the surveyor's records had to be computerized, the Mladenoff map represents a huge amount of work. We are so fortunate to have this valuable tool! Cream gentian is one of those great prairie/savanna species that has been thriving well at Pleasant Valley Conservancy. It is on the State Threatened list and has a relatively high Coefficient of Conseratism (7). Because it is relatively short, it is generally hidden in our tallgrass prairies, but tends to be more visible in the savannas. The photo here was taken in the Valley Prairie, and you can see rattlesnake master flowering behind it. I am not sure why the Valley Prairie populations of this gentian are so large, but it may be related to its interesting hydrology. 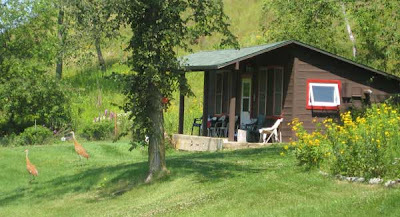 This prairie is a long, relatively narrow strip of land that is adjacent to the spring-fed sedge meadows and cattail marshes that line Pleasant Valley Creek. The mowed fire break that separates the Valley Prairie from these wet areas was established in a rather arbitrary manner by simply mowing along the edge of the sedge (Carex trichocarpa). The change in elevation between the sedge and the prairie is no more than a few inches, but presumably enough to suit the gentian. 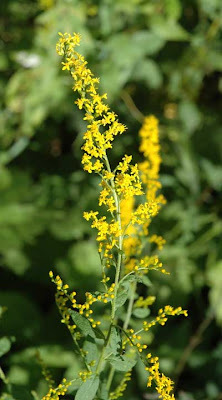 Elm-leaf goldenrod (Solidago ulmifolia) is now in flower. This species is characteristic of savannas and woodlands. Although not especially unusual (it has a C value of 5), it is not too well known. Before restoration at Pleasant Valley Conservancy, our main site for this species was the road cut of County Highway F, where we collected seeds. As restoration progressed, it has been in our savanna seed mixes, and is now scattered throughout the preserve. Because of its leaf structure, this species is also relatively easy to identify even when not flowering. Rattlesnake plantain (Goodyera pubescens) is now in flower. This orchid has a distinctive leaf pattern that makes it easy to identify. 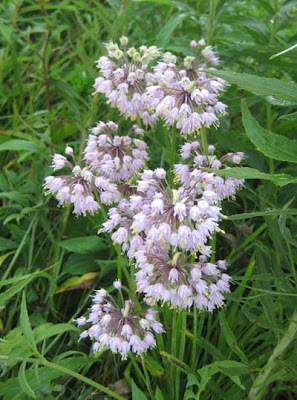 It is found in dry upland wooded areas with substantial shade. This species is evergreen and in relatively snow-free winters the snake-like leaves are occasionally seen in the woods. 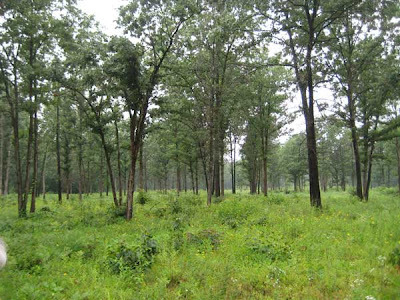 When we were doing lots of tree and brush cutting about 10 years ago, we would frequently see scattered plants. It is easy to identify because of its unique basal leaf structure. Rattlesnake plantain was probably earlier more common at Pleasant Valley Conservancy than it is today, but it is sensitive to fire. 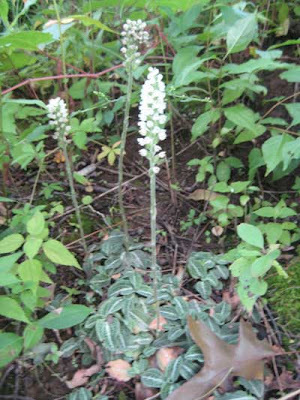 The plant shown in the photo is one of three that is visible from our woods road, so we are able to keep an eye on it. This spring the woods here had a very fine burn but Kathie wetted down these plants well so that when the fire passed by they would be protected. 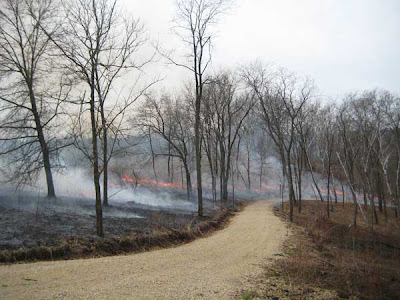 The photo below shows this area during the burn. The orchid habitat is just where the road curves. Fortunately, I remembered to look for these plants today and was delighted to find two of the three plants in full flower. 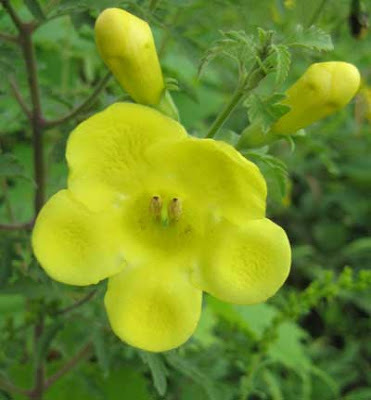 Large-flowered false foxglove (Aureolaria grandiflora) is in full bloom now. This attractive plant is especially interesting because it is a parasite on oaks. (It is actually called a "hemiparasite" because it does not kill the host plant.) It is a member of the Snapdragon (or Figwort) family, which has quite a few other hemiparasites, such as wood betony, lousewort, and Indian paintbrush. Seeds of false foxglove germinate normally but never grow as full plants unless their roots can parasitize oak roots. We introduced this species to Pleasant Valley Conservancy when we first removed all the invasive shrubs and trees back in the early 2000s. The seeds were planted under the drip line of the oaks, which is where the tiny roots of the tree are present. It took several years for the original seedings to get established, but since then it has spread on its own. We now find it widespread in our savannas. It seems to be flourishing especially well this year, probably because of the good rains we have been having. Woodland sunflower (Helianthus divaricatus, strumosus, etc.) 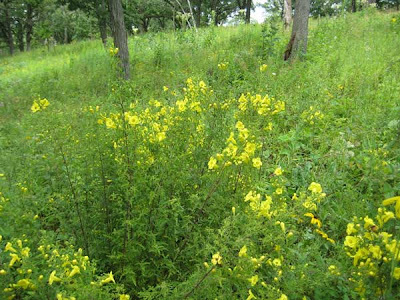 is a highly invasive native species which is in full bloom at present. This is the time when it is easy to see how widespread it has become in some of our savanna restorations. We have been aware of this species for some years, but other problems always have had higher priority. Also, there is no real guidance in the literature on how to control it. It is a fiercely clonal species, and forms such dense patches that nothing else can become established, as this photo shows. In a shaded site such as this, flowering is sparse. However, since it invades primarily by spreading rhizomes, flowering is not essential. The stem density here is amazing, lots worse than Canada goldenrod or other clonal species. Since it may also be allelopathic, nothing else has a chance to get started. Small patches can be hand pulled or dug. It is essential to get the whole root mass, since if cut or broken above ground it will quickly resprout. Note that it cannot be controlled by mowing, despite some published recommendations. The underground root system must be eliminated and the only way to do that for large patches is by spraying. I have been spraying patches with Garlon 3A (4% aqueous). I found that the best time to spray is late May, after all of the stems in a patch have emerged. However, it is necessary to return to sprayed areas later in the summer, as there are seem to be a few new shoots emerging that escape the herbicide. Therefore, I mark every sprayed patch and plan to return again next year just to be sure. Once the plants are dead, I have been seeding the sprayed area with native grasses, because the area will otherwise simply remain bare. 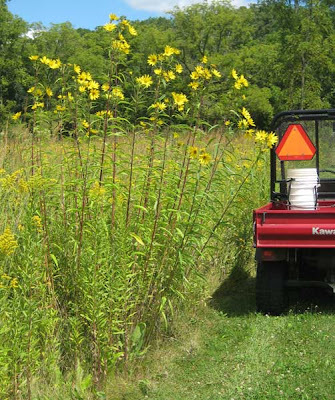 Eradication of woodland sunflower is another one of these long-term restoration problems! Nodding onion (Allium cernuum) has become widespread at Pleasant Valley Conservancy in our savannas and is now at peak bloom. Although this species is also widely cultivated by gardeners, our populations have mostly spread on their own, as we have continued to control invasive shrubs in our savannas. It is also a prairie species, although most of our populations are in the savannas. Although this species is widespread in the U.S., it is fairly restricted in its distribution in Wisconsin, just a few scattered counties, although our county (Dane) is one of them. 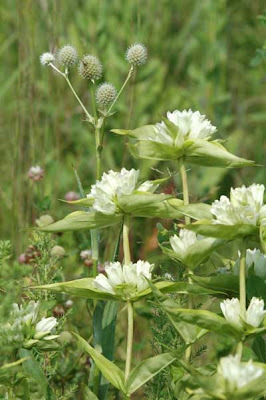 According to Cochrane and Iltis (Atlas of Wisconsin Prairie and Savanna Plants), it is found primarily in dolomitic or other calcium-rich areas. This agrees with my observations; at Pleasant Valley Conservancy it flourishes on the ridge top savannas (Prairie du Chien Dolomite). Yesterday while mowing our trails/fire breaks, I saw it all over, sometimes single plants, but more often large clusters. It is quite an attractive plant and should be easy to get established. It has a Coefficient of Conservatism value of 7, a fairly high number. Our cabin is fairly close to our wetland, so it is probably not surprising that we see sandhill cranes from time to time. However, usually they fly off as soon as they spot us. Yesterday I was able to snap the pair shown in the photo by walking slowly toward them, although the step I took just after this photo was taken was enough to send them skyward. This pair has been around all summer. Pretty nice. Among other bird sightings was a brood of 10-12 pheasants, wandering along the fire break between the Valley Prairie and the wetland. Since these young ones are reluctant to fly, they will run the whole length of the fire break rather than scoot into the tallgrass prairie. Queen Anne's lace (Daucus carota) is in full flower now, the perfect time to control it. We find it mainly in our newer planted prairies, with occasional isolated plants in some of the savannas or older prairies. Some people don't worry about this plant, rationalizing that it will eventually go away on its own. However, our experience is that it must be controlled, especially in the early stages of a prairie planting, or in areas where it is heavy. Like so many other biennial weeds, hand pulling is the method of choice. For smaller plants or when the ground is moist, simply pulling by hand works fine. For larger plants, or when the soil is dry, the Parsnip Predator shovel is needed to dig down and cut the root, after which the plant can be pulled. Because this is a fairly slow process, another approach in major infestations is to simply cut the stem at the soil base with the shovel, an activity analogous to mowing. Finally, for major infestations, especially in the first or second year of a prairie planting, mowing with a tractor, riding lawn mower, or brush cutter can be done. However, mowing should only be a desperation move, as it will also seriously set back all the native plants. 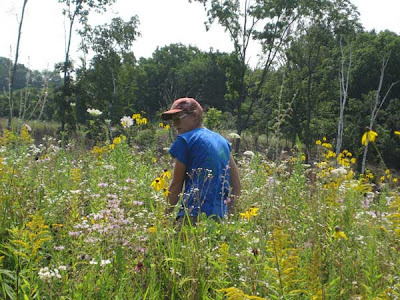 This year our main infestation is in the Ridge Prairie, a dry mesic site now in its fourth growing season. Because there are so many "good" plants present, mowing is not an option, so we dug or hand pulled. Fortunately, yesterday was "intern day", so Marci, Amanda, and I worked with the five interns. It took us about three hours to "clean up" this 2 acre prairie. Another common name for this species is "wild carrot", and domesticated carrots are cultivars of the wild species. In fact, the roots of wild carrot are edible when young, although I don't recommend them. My previous post on sumac dealt with large clones. Since large clones start as single plants, another approach is to kill the sumac plant before it becomes a clone, while it is still a single plant. The method I used was the treatment of the lower stems of intact sumac plants with the herbicide triclopyr (Garlon 4) in an oil (basal bark treatment). Garlon 4 is an oil-soluble version of triclopyr which when sprayed on the lower stem of a woody plant penetrates the bark. 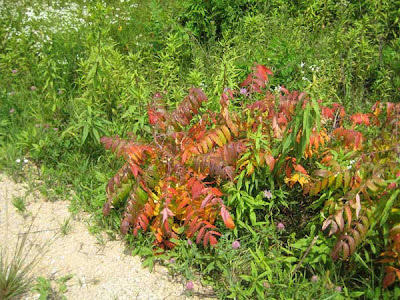 The photo above shows two sumac plants treated 10 days ago. They are in the process of dying. Within another week their leaves will turn brown, curl up, and fall off. The whole plant will be killed. I first tried this approach a year ago. I waited a year to be certain that no resprouts developed. Although basal bark treatment can also be used on large sumac clones, it does not eradicate the clone because there are many underground rhizomes with living buds. After the above ground stems are killed, some of these buds start to grow and send up new shoots. Apparently the herbicide does not spread throughout the whole clone. Since single plants do not form underground rhizomes right away, they are completely killed by basal bark treatment and are thus eradicated. This technique is really very easy. No cutting is involved. Use a spray bottle that forms a fine mist. Take hold of the sumac stem and pull it toward you, thus exposing the base of the stem. Spray a band of herbicide a few inches wide up from the soil. With care, the herbicide can be confined just to the sumac stem area and does not reach any adjacent plants. In the photo above, the untreated plants nearby seem to be completely unaffected. Getting rid of the sumacs when they are single plants makes a lot of sense to me. 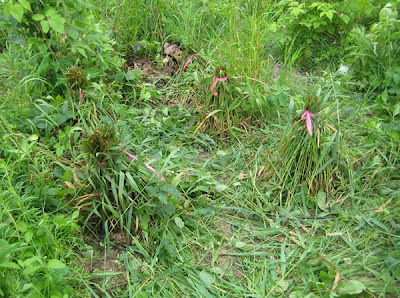 The photo below shows a prairie remnant in which individual sumac plants had been basal barked. The dying plants stand out clearly, and there is no damage to any nearby plants. This past week Kathie and I and Rich Henderson attended the Midwest Oak Savanna Conference that was held in the "Oak Openings" region of northwestern Ohio (near Toledo). This region is probably the farthest east in the U.S. with a complete functioning oak savanna. It owes its existence to the unique geological conditions of this area. As the last Wisconsin ice sheet retreated from this area (creating Lake Erie) it deposited sand bars and beaches on top of an impervious clay layer. On the dunes where sand is deep enough, arid conditions develop too harsh for forests but ideal for prairies and large spreading oaks. The flora is an outstanding array of prairie and savanna species. This is one of the easternmost areas of the so-called "prairie peninsula" that is so much more common farther west. 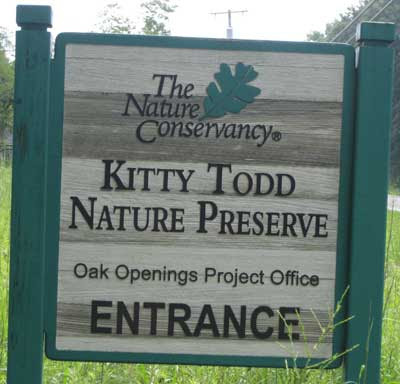 Many organizations and groups are involved in protecting and restoring the Oak Openings region, including the Toledo Metroparks System, the Ohio Natural Areas System, the Nature Conservancy, the Ohio State Forests, several county conservation districts, and numerous private groups and individuals. The Oak Openings Region Conservancy and the Green Ribbon Initiative were the prime movers for the conference, which is the first oak savanna conference since the one held in Madison, Wisconsin in 1997. The field trips were the outstanding event of the conference. The one we attended visited the Kitty Todd Nature Preserve of the Nature Conservancy. 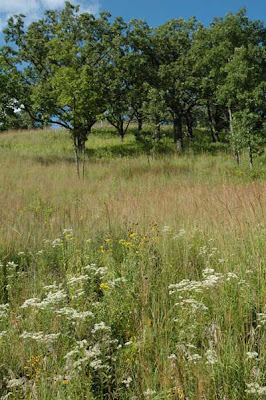 This >700 acre preserve contains the full spectrum of oak savannas and treeless wet prairies. (See photo above) Among other things, we saw numerous state-listed plant species, as well as an outstanding display of Platanthera ciliaris (the yellow-ringed orchid). An excellent book on this region entitled "Living in the oak openings: A homeowners guide to one of the World's Last Great Places", has been published by the Nature Conservancy and can be obtained gratis from their field office at 10420 Old State Line Road, Swanton, OH 43558.